After completing the Control File setup you can start entering individual inventory items. You need to understand the proper setup of inventory items in order to manage your inventory efficiently and correctly. Each of the fields in the setup screen is discussed here. See Control Files: Inventory Store, Locations, Classes-Categories. "Item Code:" is a required field and cannot be changed once set up. The code may be up to 15 characters but no more than 4 if POS direct update. POS direct update is used when POS items are created from POS items. You can type the code or you can scan the code. If you use a scanner, do so when you are in this field. To add a barcode to an existing item, place your cursor in the "Vendor item code" field (Field 2) and scan the code or type it if it is alphanumeric. 1. "Item description:" up to 30 characters. It should be easy to find when searching for an item by description. For example, you might want to start like items with the same word such as BOOK or BEEF. That way you won't end up with CHIPS LAYS and LAYS CHIPS, which would not be consecutive in a lookup. 2. "Vendor item code:" Enter the code that your vendor uses for this item. It is informational only. You may leave this blank. To add a barcode to an existing item, place your cursor in this field and scan the code or type it if it is alphanumeric. 3. "Purchase unit of measure:" Enter the unit of measure used when purchasing this item. For example, CASE, LB, EA. These are not predefined. Use what makes sense to you. 4. "Unit cost/ purch unit:" Enter the cost (not the sale price) for each purchase unit. If you purchase by the case, enter the cost for a case. 5. "Stock unit of measure:" Enter the unit of measure used when stocking this item. It may or may not be the same as the purchase unit of measure. For example, CASE, EA. 6. 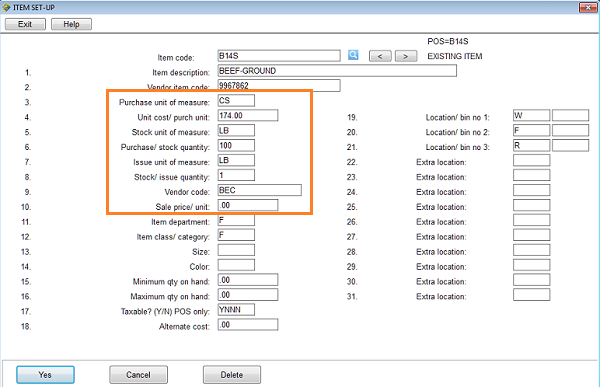 "Purchase/ stock quantity:" Enter the purchase-to-stock quantity ratio. For example, if you purchase a case (Field 3, purchase unit of measure) and you stock individual items and there are 12 items in a case, then you would put 12 in this field. 7. "Issue unit of measure:" Enter the unit of measure used to issue this item, whether you issue the item through a POS sale or you issue it manually through Miscellaneous Postings. For example, EA, ML, LB. This will be explained more thoroughly in the following sections, Bulk Items and Liquids. 8. "Stock/ issue quantity:" Enter the stock-to-issue quantity ratio. For example, if you stock by the case and issue by the each and there are 12 items in a case, you would enter 12. If you stock by the each and issue by the each, then you would put 1 in this field. This will be explained more thoroughly in the following sections, Bulk Items and Liquids. 9. "Vendor code:" Enter the vendor code (up to 5 characters) for the vendor from whom you purchase this item. 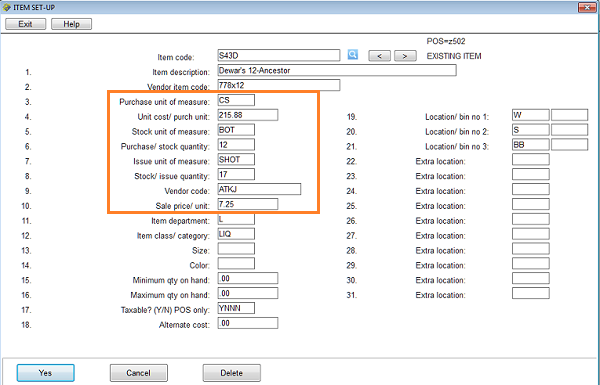 See also Inventory Overview for parameters. 10. "Sale price/ unit:" If this is a retail item that is sold through Execu/Touch POS, enter the sale price for that item as it should be priced in POS. 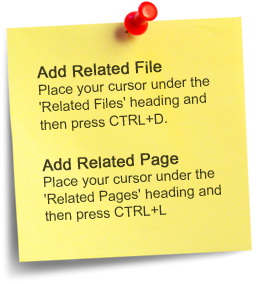 If you are using this price as a recipe component or if this is not a saleable item leave this field blank. 11. "Item department:" - Enter the 1-character code for the Item's revenue department. This may be the same as the class/category or it may be different. For example, you might have an item department C for clothing but classes/categories TSH for T-shirts and JAC for Jackets. This can match the POS Revenue Department for this item if you want to keep things simple. See Inventory store setup. See POS revenue department setup. 12. "Item class/ category:" Enter the code (1-4 characters) for the item's class/category. 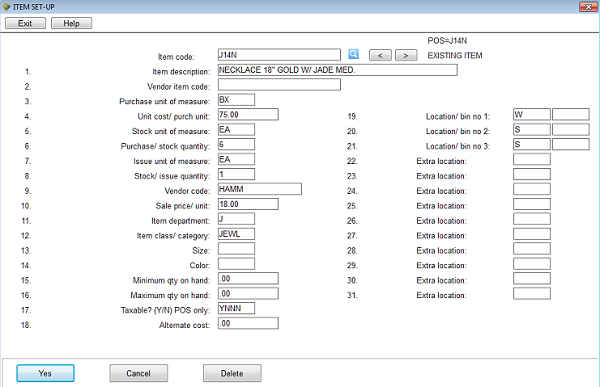 It may or may not be the same as POS category although you will enter the POS category code for this inventory category in the Class/Category setup. See Item Class/Category setup. 13. "Size:" Enter a size for this item. You may leave this field blank. 14. 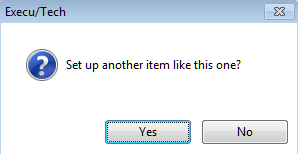 "Color:" Enter a color for this item. You may leave this field blank. 15. "Minimum qty on hand:" Enter the minimum quantity to keep on hand. You may leave this field blank. 16. "Maximum qty on hand:" Enter the maximum quantity to keep on hand. You may leave this field blank. 17. "Taxable? (Y/N) POS only:" Enter Y or N for the four fields that apply to the four POS taxes. For example, YYNN. The default can be set for this. See Inventory Overview. See also POS Store Record for POS tax setup. For non saleable items you may leave this field blank. 18. "Alternate cost:" Optionally enter an alternate cost for this item. You may leave this field blank. 22-31 "Extra location:" You may enter additional locations for this item. These fields are not required. Below is a POS revenue department. See Item #11 above, "Item Department". See Store Record for relevance. Below is a recipe for a POS item (HAMBURGER) using the inventory item shown above (BEEF-GROUND). Below is a liquor sale. The first image is the inventory detail and the second image is the POS master folio. Control Files: Inventory Store, Locations, Classes-Categories.